So we've made it to part two okay. This still has instances of the big red hair phenomenon I talked about. I'll try to keep these descriptions briefer though and let the pics speak for themselves as I feel I've already spent far too long thinking about this than is actually healthy already! So, on with the countdown. Okay, so she's part bee. I think I could be willing to overlook those wings she has. Who knows, they could be useful for breaking the ice at parties. Anyway, despite the fact that her head is far too big for her neck to support and her waist is just far too thin to be healthy Princess-W-H-N still gets a high ranking. Just look at her. She looks great. She is yet another one with the big red hair I noticed. She has quite a cool voice and best of all if she is willing to go out with a non-too-bright earthworm in a human shaped suit then I figure if I ever become a cartoon I should be well in with a chance at least! When I started compiling this list for a long time I assumed Jesse would be first, and it was damn close (until the new no.1 came along anyway). Jesse is everything a cartoon women should be. Huge red hair again, large eyes, short skirt and is able to do things on her own. She basically leads Team Rocket. Admittedly it wouldn't be a good idea to get on the wrong side of her temper, but she has shown her sweet side many a time as well. Also, as the pictures show, she isn't afraid to dye her hair different colours (and I have to admit to being a sucker for girls with green hair). Jesse also ranks highly on my list as she is supposed to be evil. Evil characters are nearly always better. Just look at the coolness of Skeletor. 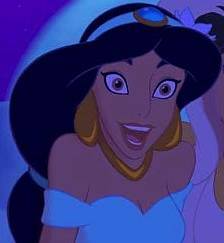 Jesse's other plus point is she is one of the few cartoon women who (a) has a change of clothes! and (b) isn't afraid to wear a bikini now and then. All that and if you talked to her about Pokemon she wouldn't get a disgusted 'get away from me you sad freak' look on her face. She'd actually be interested! Gotta be a plus. I remember the first time I saw Kylie. I couldn't believe they'd made a goth cartoon women and I couldn't believe how great they'd made her look. She has been my favourite for a long time and I figure if Jesse couldn't knock her from the top spot there are going to be very few in the future who even come close. And the beauty of Kylie is not only does she look great, but she also is highly intelligent and full of witty comebacks as well. What more could you want? She is my former no.1 no less, but now relegated to number 2 who can be the feisty newcomer who has dived straight into the premier spot? Well she has basically dived straight into the top spot here. Blowing away all other competition. Let's recap her plus points apart from looks; She has purple hair (Not Red! ), drinks alcohol for breakfast, she's funny, but also caring and she owns a penguin as a pet. 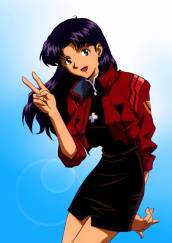 She is also intelligent as her promotion from Captain to Major in NERV shows and she can keep her head under pressure. 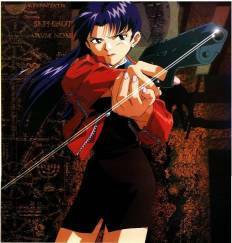 Also she has the honour of staring in one of the most original and well written cartoon series I have ever seen. The last few episodes I just couldn't take my eyes away from the screen. Misato is leading the field by a long way at present and I can't see her being beaten for a long time.